It hasn't been possible for many Royal Parks' staff to take time off work this summer with the Diamond Jubilee, the Olympics, the Paralympics and other park commitments, so I've taken a week off in October and am looking after my son while my wife trains to be a forest school leaver. Last night however, I had a night out - at the Richmond Society Annual Meeting where Richmond Park's new gates 'The Way' won a Richmond Society Award! The new pair of gates added on the historic vista from King Henry's Mound to St Paul's Cathedral, opened for the first time on Friday 01 June, marking the Cathedral's tercentenary. They were designed by artist blacksmith Joshua De Lisle and previewed by Her Majesty The Queen at Richmond Park's "Wild London" Diamond Jubilee event. 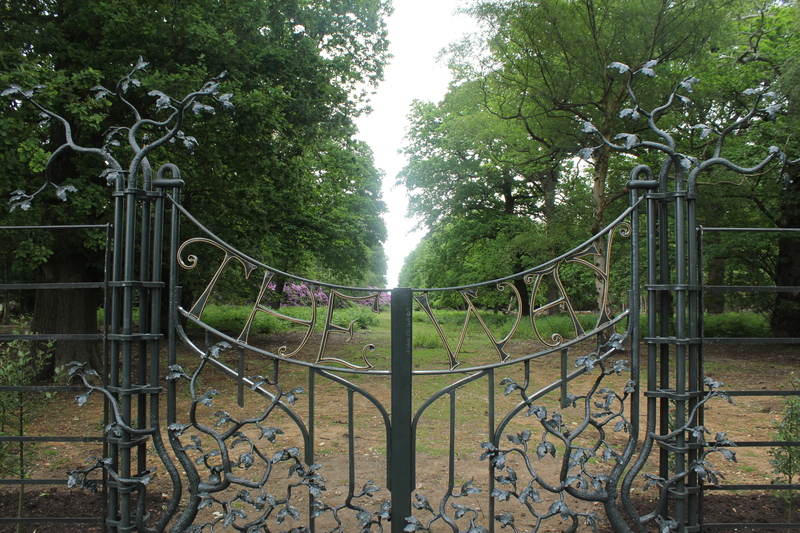 Kindly donated by the family of renowned environmentalist and The Ecologist magazine founder, the late Edward Goldsmith, the gates are called "The Way"; evocative of the protected vista and an epigraph to Edward who authored a book by the same name. I absolutely love the gates and am genuinely delighted they have won this award. We worked so hard to get a design and build that we thought would work well. But we didn't really know if they would be right until the moment they were installed and public opinion could be judge. I've only heard praise for the gates and gaining the award reinforces the informal feedback I have heard. Tonight I am giving a short PowerPoint presentation to the Sheen Society about the gates so I will have some news to share with the audience! Living in the park is such a wonderful privilege, but my week off hasn't all been about Richmond Park. On Sunday, my son and I visited neighbouring Home Park in Kingston. The shire horses that work in Richmond Park are based there and one of the six horses, Massey, is owned by The Royal Parks, so it's good to see how he is keeping when he is not working in Richmond. He was looking really well; he's fit and very happy in the herd with plenty of turn-out to run around in. At Hampton Court the horses pull a carriage that can seat 20 or so people. We took a ride and sat near the front. It's amazing to watch the horses work and they attract so much attention from the public, largely because of their size - Massey is 6ft 2" at the top of his back, so his head is about 7ft 8" off the ground! On Monday morning I took a walk a dawn in Richmond Park. I saw two Fallow deer Bucks in full rut. They were walking up and down a track, parallel to each other and would occasionally drop their heads, to clash antlers and have a pushing match. I've never seen Fallows rutting quite so spectacularly - you have to be up early as they are easily disturbed, and you need to keep your distance because if they spy you (or your dog) they are easily spooked. The 50m minimum distance recommended by The Royal Parks is a good guide to ensuring that the deer are not disturbed. After a day out on Wisley Common and visit to Norbury Park where Richmond Park's green oak signs are made on Tuesday, we spent Wednesday back in the park at the Isabella Plantation. Every small boy loves ducks, but we try and avoid feeding them bread - if we over-feed the ducks it just results in the ponds being polluted and the silt builds up faster. All in all - a great week in The Royal Parks' Richmond Park.